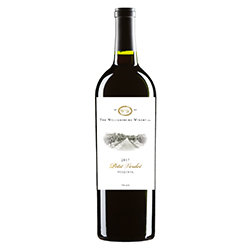 A bold wine offering many layers of dates, plums, prunes mixed in with dark cherry, blackberry and blueberry. The bold fruits are well paired with the warm spices of nutmeg and clove. All of this is wrapped up in a blanket of chocolate, including chocolate covered malt balls. With the fruit and chocolate there is a hint of green and black olives with just a touch of coffee. The mouthfeel is dominated by a mixed berry pie and a touch if spiced coffee. The tannins and oak are strong but match well with the bold fruit aspects. This wine should age well and will pair well with lamb.